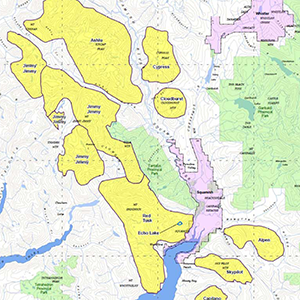 The combined tenures of companies operating in Whistler total nearly a million acres, meaning fresh tracks always await skiers and boarders on nearly every run. For those short on time but big on powder. Descend never-before-skied runs, and end the day where it started in Whistler's vibrant village. Our four-run package averages 6,000 to 10,000 vertical feet of skiing or snowboarding (1,800 meters to 3,000 vertical meters). At $1,100Cdn +7% Resort Fee +5% GST for 4 runs you won't find more skiing or more fun for the money. Anywhere. Extra runs can also be purchased when conditions are favorable. Tours take place at Tricouni Mountain – a place with untracked powder and epic panoramas. We guarantee 7,000 vertical feet of skiing or snowboarding. On an average day you can expect to do six to nine runs. At $599Cdn +7% Resort Fee +5% GST for a full day our catskiing experience is your best bet for getting the most untracked snow for your money. No matter what your powder ability, we have runs for you! Just learning to link turns in powder and want to get "the trick"? How about a 4,000 foot run down a glacier? By the nospace of the run you will know how to powder ski, and if you don't, we'll just have to do it again. If you already have powder skiing or riding ability, we have runs that will make you want to quit your job, cash in your retirement plan and live in a motor home in our parking lot. Our fully certified heli and cat guides will take you into the backcountry to experience powder skiing and riding like it is supposed to be: un-tracked, un-hurried, un-crowded, unbelievable. Epic bowls, long glacier runs that have the most perfect pitch, peaks that look so sweet you want to drop in and do a thousand turns, or just three from top to nospace. And of course mind blowing tree runs that leave your jaw on the floor. 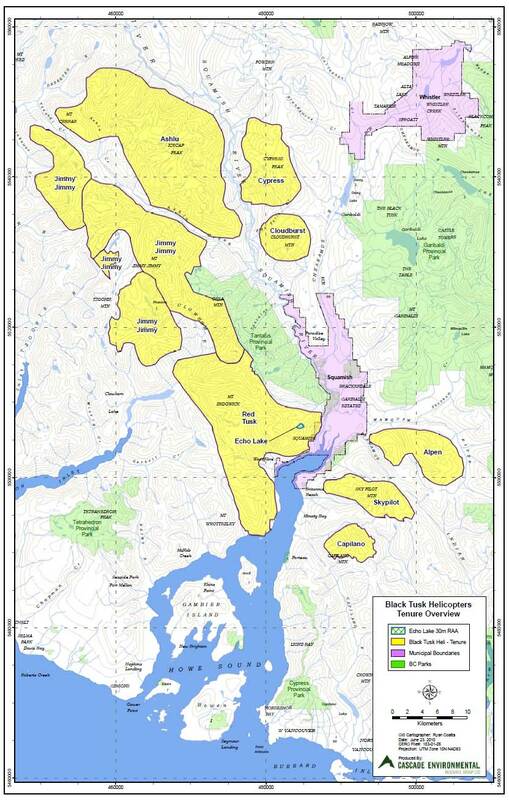 We are partnered up with Black Tusk Helicopter, who have the 247,000 acre tenure all around us and down towards Squamish and Vancouver. It's almost safe to say if you've ever thought about skiing anything you can see from Highway 99 to the Powder Mountain base lodge on your way up to Whistler, you can ski it with Powder Mountain Heliskiing. We fly A-Star helicopters which lift one pilot, one fully certified professional heliski guide, and four guests to some of the most amazing and easily accessible terrain anywhere. When it snows in Whistler, it snows even harder at Powder Mountain Catskiing. We traditionally get double to triple the snow from a storm cycle than Whistler Blackcomb. That means if you want to ski or ride powder on your trip to Whistler, you want to come skiing with us. The anticipation starts when you meet up with the maximum of 11 other people in your group. You'll be talking about all the turns you're going to make, how much fun you're going to have, all the face shots you're going to get, all the stuff you are going to jump off. Sitting in the cat as it climbs up the mountain you'll notice the snow getting deeper and deeper as you get closer to the powder runs, giving you butterflies. Seeing huge mountains all around brings back the feelings you had the first time you ever went into the mountains. Excitement, anticipation, nervousness, and best of all exhilaration. Stepping out of the snowcat at the top of the run, whether it's your first time ever in a snowcat or your 100th trip, seeing all that powder with no one around to track it up other than you and the other people in your group is something you'll remember forever. Clicking in your bindings after listening to the guide describe the run you are going to take makes you so excited you feel like a five year old on Christmas morning. The days, weeks, and months of waiting for this exact moment are over: you're finally here. You drop into the run and sink your first turn. It's everything you've dreamed of. It's the best thing ever, and it's only the first turn of the first run of your first day. At the end of the day you check out the photos from the day at our base lodge before you ride back in the Powder Mountain 4x4 vans to Whistler. Boisterous laughter and shouts of "great run"; "It was so amazing"; "I didn't think it was going to be that good or that easy"; change to silences that fill the van with just as much enjoyment as the laughter did moments ago. People you didn't know at the start of the day have now swapped email addresses and phone numbers to make this magic happen again. At $1,100Cdn +7% Resort Fee +5% GST for 4 runs, we understand that a day heliskiing or heliboarding in Whistler will not be the least expensive day on your ski trip. It has to be the best day of your trip, so that when you get home, all you think about is how to get back here, not what you paid. Everyone at Powder Mountain lives for powder days and powder runs. We want to share with you the most amount of skiing we can safely pack into a day. You won't find more skiing or more fun for the money. Anywhere. At $599Cdn +7% Resort Fee +5% GST for a full day, Catskiing or Catboarding is your best bet for getting the most untracked snow for your money. A day spent at Powder Mountain Catskiing is a full day spent skiing or riding. An average day is 7-9 runs. We are as happy to ski more than the average as you are, and there's no charge for extra runs. You won't find a better powder day in Whistler. The best thing about a helicopter is that it can go pretty much anywhere. From the front seat out fully certified guides sniff out the best run, every run. With skiing and riding on all aspects, there is seldom a day where we go skiing that isn't "Your Best Day Ever". Helicopter groups have only four people, and any mismatch of abilities is minimized when we group guests so everyone has approximately the same ability. That way your day is the most fun, with the best skiing and a relaxed and truly enjoyable atmosphere. Snowcats make it easy for us to choose the perfect runs for you regardless of your ability. With two certified guides and a relaxed pace, it's the ideal choice for those who want to learn to ride powder, or for those who can shred with the best. Relax in the cat for a breather, or go for max vertical. If you need even more flexibility, give us a call and we'll see what we can work out. Powder doesn't last long in Whistler anymore. It lasts forever at Powder Mountain. We may be only 20 minutes down the road from Whistler but we're in a different snow belt. We get more. Way more. Our powder is fresh, not farmed. 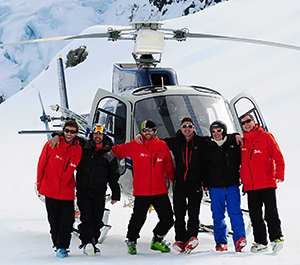 Our fully certified helicopter guides can sniff out the best run to make your day the best ever. With 387 square miles of terrain spread on mountains with runs on every aspect of the compass, the skiing is always un-tracked, un-hurried, un-crowded, and unbelievable. At Powder Mountain Catskiing, we never run out of powder. With a maximum 24 people skiing the 4,300 acres and five peaks, we run out of legs before we run out of fresh powder. Our powder is fresh, not farmed. Catskiing is like the best day ever on Whistler Blackcomb, just without the crowds and the hardpack. Our helicopters can't fly when the visibility is poor, which happens when it snows hard. We may need to cancel or move your trip if the weather isn't cooperating. Should we need to cancel on you, we don't charge you. 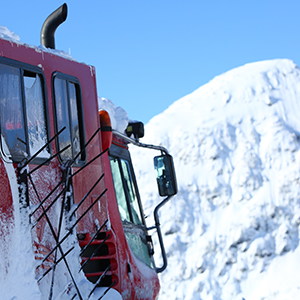 Our snowcats can take people skiing in all conditions - they don't get shut down due to weather like our helicopters do. When you book a seat and spend months looking forward to getting the powder skiing you have dreamed of, you get it. Some of the best days we have are when it's snowing so hard helicopters are unable to fly: the harder it snows the better the skiing. Your safety is our prime concern. We constantly monitor snow and weather conditions throughout the day so you can be as safe as possible in the backcountry. We provide transceivers and train guests on their use during our safety orientation session. Read more about safety in the FAQ. One of the best things about Powder Mountain is that it dumps snow like few places on earth. We get double to triple the snow Whistler Blackcomb receives in a season, depending on the year. The storms come off the ocean and slam into "our" mountains. Making for awesome skiing and riding. It also makes for quite a few days where the helicopters are unable to fly. We're the only heliski company in Whistler that also has snowcats, so if it's impossible to fly, we go catskiing instead. You still get the best day ever, instead of sitting on a chairlift wishing you were having your best day ever. The Catski backup needs to be pre booked and comes with a seat charge. There is nothing worse than booking your day of Whistler heliskiing in October, waiting three months for "the day" and then being shut out and not skiing. The weather means that it happens a lot at other heliski companies in Whistler. It doesn't happen to Powder Mountain Heliskiing. Meet at 4154 Village Stroll 4154 Village Stroll at 07:45 am to check in and sign your waiver. Be dressed and ready to ski. Please don't be late: we can't wait. We drive guests in our 4x4 vehicle to our simple base lodge where we have a cozy fireplace and bathroom facilities. After a short talk on the day's proceedings and a short helicopter or snowcat safety briefing, we load up and head out into the backcountry. After that, it's time to get our first taste of the day's snow. You will be at around 6,500 feet altitude ready for the first run of the day. The first run is always mellow to let everyone get warmed up, and to allow the guides to get an idea of the ability level of the group. The groups' ability and snow conditions determine what kind of terrain and runs we will be riding. People usually choose to eat our delicious sandwich lunch in the Cat so as not to waste any skiing time. Drinks and other snacks are always available. At the end of your day we either get in the cat for the ride down, or if you have the legs for it you can ride down the cat road. That can be a bit hectic so please ride in the cat if you're at all unsure about it. In the helicopter, the day's end depends on how many extra runs you decide to do. You return to our Base Lodge, check out the photos, then transfer into our 4x4 vans and head back to Whistler. Our helicopter operator is Black Tusk Helicopter, who have the 247,000 acre tenure all around us and down towards Squamish and Vancouver. It's almost safe to say if you've ever thought about skiing anything you can see from Highway 99 to the Powder Mountain base lodge on your way up to Whistler, you can ski it with Powder Mountain Heliskiing. The A-Star is small, nimble, fast and safe - the perfect machine for flying in the mountains. The A-Star Helicopter is the most beautiful ski lift ever invented. With just 6 seats: one pilot, one fully certified heliski guide and four guests, your day is incredible from the second you arrive. When you ski from an A-Star you will remember it for the rest of your life. It's that good. Click this image to see our full tenure. 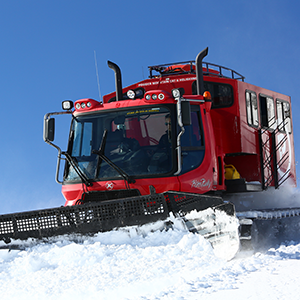 There is no snowcat that can compare to the power, reliability, comfort and speed of the Pisten Bully. A few years ago we made a huge investment and upgraded all our cats to Pisten Bully 300's from Cold Smoke Leasing Co. That increased the speed of the cats so we get more runs each day. Our new cats are so fast everyone can have an epic powder experience. The Pisten Bullys deliver superior comfort and reliability when it comes to getting up the mountain to get the untracked snow. The cats have bucket coach seats in the passenger cabins which really let you relax on the way up the mountain in between runs. It's amazing how much less energy you use over the course of a day not having to hold on to the seat in front of you and just settling back into your seat. Some guests said it made their day. Everyone has more energy to ski. The cabins are heated, so even on the coldest day catskiing is a warm fun powder adventure. When it’s minus 20 and the snow is as good as it will ever get, having a heated 10-15 minute ride up for your next run will make you ready to really charge on each run. It might ruin you for chairlifts and t-bars forever! With the cabin's big windows, you get the best view of the surrounding peaks that have made this part of the world legendary.